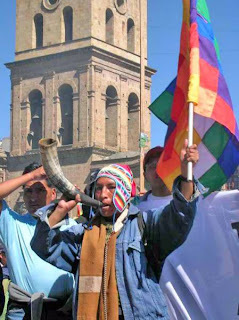 First elected in 2005, Bolivia’s first ever indigenous president was sworn for his second term as head of the new “Plurinational State of Bolivia”. This title replaces the old “Republic of Bolivia” under the new constitution, drawn up by an elected constituent assembly and adopted by referendum, in recognition that the new state incorporates Bolivia’s 36 indigenous nations for the first time. The inauguration was filled with symbolism to highlight his point. It took place under the gaze of indigenous resistance leaders, such as Tupak Katari and Bartolina Sisa, whose portraits now sit along side those of Simon Bolivar and Jose de Sucre, leaders of the fight for Bolivia’s independence from Spanish rule. Morales handed over the old presidential sash, to be laid to rest in a museum, and received a new one lined with the colours of the Whipala flag — the traditional symbol of Bolivia’s indigenous people. He took his oath with his right hand on his heart and with his left fist raised, swearing not on the bible but the new constitution, which incorporates many rights for the indigenous majority for the first time. The newly elected Plurinational Legislative Assembly he addressed was filled with parliamentarians in indigenous attire and miners helmets — a further sign of changing times. Morales recalled how only 50 years ago indigenous people were not even allowed in the plaza outside congress. Women make up a record 30% of the new assembly and Morales’s newly appointed cabinet has an equal number of men and women. Morales’s party, the Movement Towards Socialism (MAS), now has the needed two-thirds majority in the assembly to approve laws previously blocked by the right-wing opposition. These laws aim to establish the legal framework to implement the new constitution’s objectives. Morales said an immediate task was “a profound revolution in the judicial power”, which he said had worked to undermine his government. Under the new constitution, heads of the judicial system will be elected by the people. However, Morales said: “Although the Armed Forces have participated in helping us attend to social demands, the recuperation of our natural resources, I feel something is missing ... unfortunately in some military institutes, they continue to teach that the enemy is socialism. “We have to change that. The real enemy is capitalism, not socialism. From Greece, a simple comrade salutes the hopeful changes towards socialism in Bolivia and other countries in Latin America.